Governor Chris Christie, five former governors, numerous elected officials and nearly 30 members of the Sheridan family joined Cooper University Health Care leaders today for the unveiling ceremony of Sheridan Pavilion at Three Cooper Plaza in honor of the former president and CEO of the health care system. 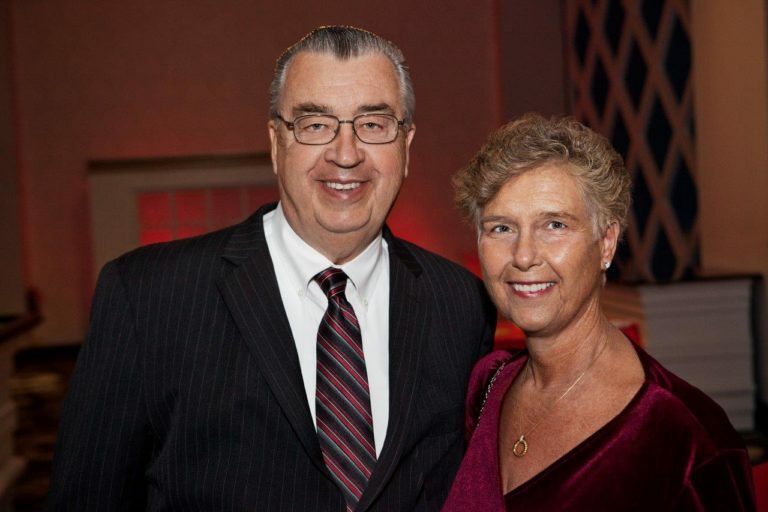 Mr. Sheridan joined Cooper in 2005 and served as president and CEO of The Cooper Health System from 2008 until his and his wife’s death in 2014. In addition to Governor Christie, the event was attended former New Jersey Governors Tom Kean, James Florio, Don DiFrancesco, Jim McGreevey, and Jon Corzine. The event was also attended by a number of other state, county, and local elected officials as well as dozens of business and community leaders. Built in 1986, the Sheridan Pavilion is a 160,000 square feet, five-story ambulatory care building in the heart of the Cooper Health Sciences Campus in Camden. The Campus was one of the many projects spearheaded by Mr. Sheridan as part of his revitalization efforts in the city. Mr. Sheridan was passionate about serving the Camden community. The building that bears his name averages more than 100,000 patient visits a year and houses primary care, specialists, and community health physicians that provide care for local residents and families. Mr. Sheridan joined Cooper in 2005 after a long career in public service and in the law. Prior to joining Cooper, he was a senior partner and co-chairman of the law firm of Riker, Danzig, Scherer, Hyland & Perretti, LLP. He also served in high-level positions in state government, including commissioner of Transportation, chairman of the board of the New Jersey Transit Corporation, general counsel to New Jersey Turnpike Authority, deputy attorney general of the state of New Jersey, assistant counsel to Governor William Cahill, and counsel to the New Jersey Senate Minority. He also served as a member of the board of trustees for the Carrier Clinic for 25 years. Joyce Sheridan was a high school social studies teacher who focused on teaching students with difficult lives and who struggled academically. Mr. Sheridan played a leading role in many of Cooper’s most significant initiatives in recent history, particularly the revitalization of the neighborhoods surrounding the hospital, construction of the Roberts Pavilion, and the creation of the Health Science Campus. In partnership with Norcross, the two men turned the four-decade-old dream of creating a four-year allopathic medical school in South Jersey into reality. Mr. Sheridan called the creation of the medical school “a once-in-a-lifetime opportunity,” and Norcross credits him with devising the strategic framework enabling the state government’s approval of the Cooper Medical School of Rowan University. In 2016, the medical school graduated its first class. One of Mr. Sheridan’s most enduring legacies may be Cooper’s partnership with MD Anderson to create MD Anderson Cancer Center at Cooper. As early as 2002, Mr. Sheridan urged the creation of a top-rated cancer center at Cooper. He deserves a good deal of the credit for the partnership that brought the nation’s number one cancer center to Camden, Norcross said. “Mom and Dad dedicated themselves to making Cooper and Camden better places; Dad through his tireless efforts at Cooper Hospital and Cooper’s Ferry, and Mom through her unending support of him and his work. They were so proud of the success of the hospital and the revitalization of the surrounding community. We want to thank Mr. Norcross, Ms. Kirby and the Board of Trustees of Cooper for recognizing our parents’ contributions to the City of Camden and to this great institution,” the Sheridan family said.